Are you wondering what cold-formed steel is? Basically cold-forming is the process of rolling or pressing thin gauges of sheet steel into goods. It is commonly used in all forms of manufacturing and has become popular in the steel business industry. 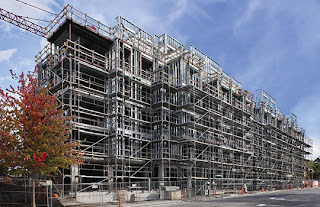 An advantage of cold-formed steel framing is that it will ease the mass of production and prefabrication as well as it helps with quick and simple erection or installation. It is generally used for steel buildings, automobiles, equipment, home and office furniture, utility poles and much more. Cold-form steel framing has many advantages over any other construction materials. These advantages are lower maintenance costs, decreased utility bills, higher resale value, fire resistance, mould free, pest free, durable, weather resistant and 100 percent recyclable and sustainable. Manufacturing cold formed steel happens in two ways. It can be manufactured either by roll-forming the steel or break pressuring. After this process you can then form larger fabricated structures such as steel buildings. This is why this particular product has become popular in the steel building industry. The thickness of this product ranges from 0.0147 inches (0.373 mm) to about 1/4 inches (6.35 mm). Other steel plates and bars that are 1 inch (25.4 mm) can also be cold formed successfully. Currently in the United States, they are using the North American Specification for the Design of Cold-Formed Steel Structural Members. Developed by the American Iron and Steel Institute, the current version being used by the members is the 2007: AISI-S100-07. Canada has also adopted this standard. The predominant building code is The International Building Code (IBC) in North America. The two types of cold-formed steel are hot-rolled steel shapes and cold-formed steel shapes. The difference between the two is that the hot-rolled steel shapes are formed by high temperatures and the cold-formed steel shapes are formed at room temperature. The cold-formed steel shapes are generally manufactured from steel plate, strip material and sheet metal. This process involves press-braking or cold roll forming in order to achieve the desired shape. A lot of the time when steel is formed by press-braking or cold rolled forming, there usually is a change in the material by the cold working of the metal. Some benefits of the cold formed steel are: uniform quality, more accurate detailing, fast and easy erection and installation, recyclable material, termite-proof and rot proof and much more. Some of these shapes can be made into framing and panels. You can use these for roof and wall systems in steel buildings, steel racks for storage pallets, plane and space trusses and much more. This product is very versatile and can be shaped in such a way for many of your upcoming in the works.